I’m thinking tonight about how to respond to such an amazing gift given in Christmas! Joseph responded to the birth of Jesus even though at first he questioned the pregnancy! He did what the angel of the Lord commanded him … took Mary to be his wife, and named his son, Jesus! The Wise Men followed the star, brought gifts, and bowed down to worship the Christ child. 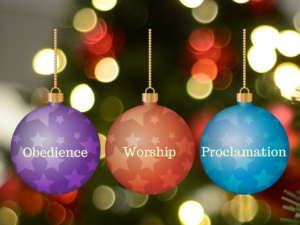 Obedience -> reflection -> worship -> proclamation! How shall we respond to the gift given at Christmas?! This entry was posted in Advent, Reflection and tagged Advent, Christmas on December 23, 2016 by instillnessthedancing.